This We First Met Here Personalized Jigsaw Puzzle is the perfect gift for your significant other on Valentines Day, your anniversary or their birthday! Show your partner how much you love them with this special and romantic gift. 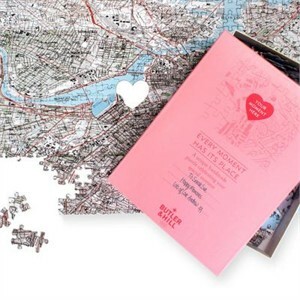 Put your relationship to the test and see how well you work together to solve this 400 piece puzzle that has a mapped radius of 6 miles (east to west ) by 4 miles (north to south). Solving the puzzle will be worth it once you uncover the secret message in the puzzle where the pieces fit to read "I Love You." The supplied address, the place where you two met, will be in the center of the map with a heart as the center puzzle piece! The completed personalized puzzle is 12 1/4 x 18 1/2 inches. Each jigsaw is individually crafted with 1.5 mm Millboard for a thoroughly detailed high quality map that features roads, notable infrastructures and even contour lines. The puzzle arrives in an attractive box with a blank space on the lid to write a personal message on. Please Note: US Addresses only. Availability:This We First Met Here Jigsaw Puzzle is made to order and takes approximately 2-3 weeks to leave the warehouse plus transit time. Please note this item does not ship express. Please choose a standard shipping method as your shipment option.